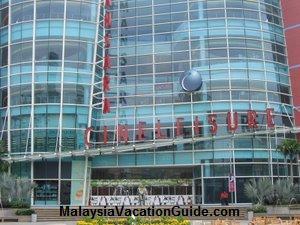 The Cineleisure Damansara in Mutiara Damansara was renamed e@Curve. It is another additional entertainment and shopping centre on top of the other mega shopping complexes here. This building together with Tesco, The Curve, IKEA and Ikano Power Centre are all located within the vicinity of each other. The concept is similar to the Cathay Cineleisure in Orchard Road, Singapore where it is designed to appeal to the youth of this generation. 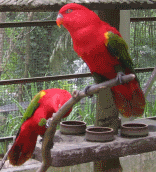 Youth related and movie related events are promoted here. Cathay Cineplex with 10 state of the art screens for you to enjoy the latest movies in town. 2 stories high giant gaming screen for you to battle it out with your enemy. Various food and beverages outlets with Western, Italian, Chinese, Japanese and other types of food for you to choose from. Retail outlets that keep up to date with the latest fashion in town. Service outlets such as manicures, pedicures and hair saloons to make you feel good and beautiful. Mutiara Damansara is linked to the Lebuhraya Damansara Puchong (LDP), the New Klang Valley Expressway (NKVE), SPRINT Highway, Pancala Link, Kerinchi Link and the North South Highwway making it one of the most accessible area in Petaling Jaya. Parking bays are available at the building itself for a fee of RM1 during weekdays and RM3 during weekends/public holidays. You can also take the free shuttle bus service provided by IKANO Power Centre. All you need to do is take the Kelana Jaya Putra Line LRT and stop at Kelana Jaya Station. Walk across the road by using the pedestrian bridge and wait for the bus at the bus station. It will pick you up from this bus station to IKANO Power Centre. Once you are at IKANO Power Centre, you will be able to see this building which is just across the road.